I'm late getting this review out but I figured it was well worth as it was such a great gig. Matt Halsall has mentioned a few times to me about Arun Ghosh who has been playing regularly at the Royal Exchange Theatre. 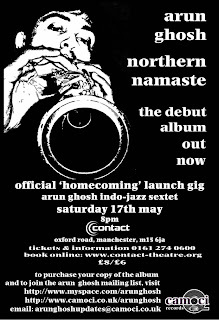 I still haven't made it to one of those but I did finally get down to the 'Northern Namaste' album launch gig at the Contact Theatre on the 17th of May. Damn glad I did as well as it was a really phenomenal gig. The band for this one was Arun's Indo-Jazz Sextet. Though I'm no expert, indo-jazz describes the overall sound well but there's a fair mix of different styles in there, much of it in a classic hypnotic modal vein. I particularly liked the track 'Uterine' reminiscent of a great Pharoah Sanders slow modal vamp. Another fave of mine was the CD opener 'Aurora' which is quite a tasty uplifting track that sets the mood and tone for the CD well. You can hear a number of the tracks on Arun's MySpace. 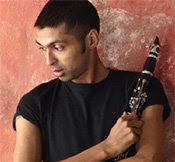 Arun is also visually captivating, swaying back and forth with one foot in front of the other propelling the notes forward with extra momentum. He frequently wanders off mic and out of the light adding a distant backdrop to the soloists. There was some great playing all round from the other players with Led Bib Bass player Liran Donin and keyboard player Kishon Khan standing out. I picked up a copy of the CD afterwards and I can highly recommend it. Buy one now. 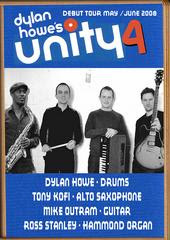 I've been feeling a bit rough this week but made the effort to catch Dylan Howe's Unity4 down at The Cinnamon Club in leafy Bowdon. The band is essentially a homage to the classic Unity album by Larry Young, one I have to confess I wasn't previously familiar with. I was keen to make it as the quartet features Mike Outram on guitar. He's another one of our local boys made good, now being firmly ensconced as a premier fixture on the London jazz scene and is currently also a Professor of Guitar at Trinity College of Music - not bad eh? It was a great outfit and there was some pretty impressive playing. Some of the tune heads were very complex and seemed incredibly hard to play but the players brushed them off with apparent ease. Some great improvising all round from Tony Kofi on sax, Dylan Howe on drums and Ross Stanley on Hammond. I like Mike's sound and feel, and he can nail a tasty fast run or two. I have a bit of a love hate one with the Hammond but Ross Stanley's swirling thick chords didn't overwhelm the sound. The Hammond is a key feature of the Unity CD and essential part of this group so I can't really complain. A good way to spend an evening down in Bowdon. So the hot weather has finally returned to this fine city of ours. I spent much of yesterday in the garden working on improvising through 'Autumn in New York'. I rather rashly suggested doing this song for a couple of duo gigs I've got coming up at the Southport Jazz Festival with Hannah Peel at the end of May. The song sounds simple enough on a surface listening but is actually quite complex in places, rapidly shifting between major, harmonic minor and melodic minor keys with a healthy dose of altered 7th chords and a whole bunch of other things going on as well. The weather and the need to practice (and the thought of an early evening beer in the garden) all made me partially regret having got a ticket to see Bill Bruford and Michiel Borstlap at the RNCM last night. I did however make the effort and it was really worth it. Just before the Bruford gig was an RNCM student showcase of Terry Riley's minimalist masterpiece 'In C'. They started a little tentavively but soon got going and gave a great rendition of the piece which was suitably hypnotic and a good aperitif for the main course. The Bruford/Borstlap duo immediately hit the spot for me with a great percussive intro instantly characteristic of the Bruford approach and sound, Borstlap drumming along with his fingers on the piano lid. The set was more or less entirely improvised with Borstlap wandering liberally between classic swing jazz sequences, Monkesque jagged blues riffs, Herbie style suspended chord grooves, contemplative nordic introverted sections and a whole lot more. There's just something about Bruford so that is so captivating. He sits more or less bolt upright and the playing is extremely precise but at the same time flows and grooves gorgeously in a way that's quite addictive to listen to. He can get very busy when he wants to but for me he's most engaging when he gets a strong pulse going and throws in his sneaky sporadic sideways jabs and cuts that make the whole thing so exciting. Bruford introduced quite a few of the tracks at length and he does come across just a tad public school pompous but he's interesting none the less so I think he can be forgiven for this. Overall a really exciting and excellent concert. My only criticism really was that the pianist could have held back a little a times to allow the full Bruford effect to come across but it's a minor point. I hope I get a chance to see these two again and would recommend missing a few hours of rare UK sunshine to see them any day.